Special thanks to Davina for her notes on the meeting! We had a great turn out—over 20 people including some new graduates from the recent academy in Saratoga. 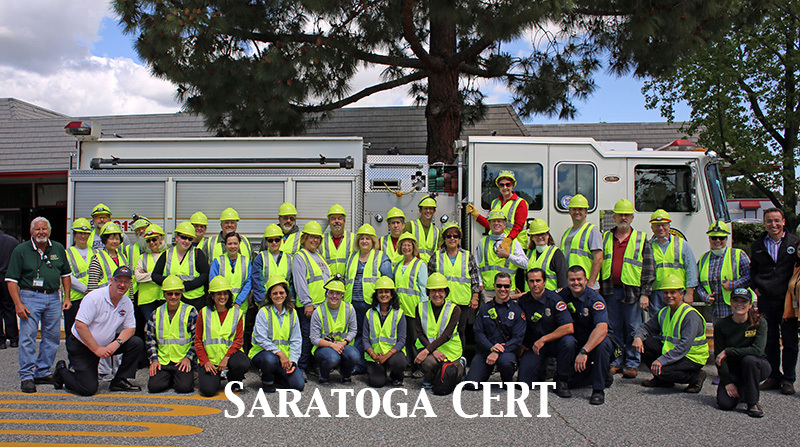 There’s still a way to go but Saratoga CERT is beginning to hum with organization and activity! The most fundamental outcome of Thursday’s meeting was the agreement that we will take the focus off training at the City level and instead make use of the excellent training put on by Santa Clara County Fire Department. So, going forward, we will continue to have a meeting in Saratoga on the 4th Thursday of most months–but meetings will start later and be shorter: 5.30pm start for just 90 minutes (and maybe not all of that time will be needed), and will focus on logistics, communication, team building and outreach. Then we will all have the choice of attending the excellent County refresher classes—with the aim that all of us try to attend at least two, preferably more, each year to keep our skills up to date. Closer to the time of each class, we ask each division lead to email out to remind their members so that you can organize a carpool–and, if people wished, stop off for a quick drink afterwards to celebrate our newly refreshed skills! Michael Taylor needs requests for equipment and supplies – definitely a list from our division leads, as well as from Jessica who heads up our recruiting team. But if any of you have ideas for requests, please send them to Michael at mtaylor@saratoga.ca.us – thanks. Starting this fall, Michael will be ordering radios for each of us – FRS radios for each DSW certified CERT member and 2m HTs for each of the DSW certified RACES members. The goal will be to speed up and simplify deployment and act as a backup for notification should AlertSCC go down – hams already tune to the SARA repeater in the case of an earthquake, CERT members will be able to turn on their FRS radios to FRS channel 11-0 and our hams will relay activation information. More details to come. Our new CERT trailer has been 95% stocked (thank you Michael!) and tours were given at the meeting. Jessica also demo’d the medical field kits that Campbell CERT builds. As a reminder – we need someone to take over for CERT-wide logistics lead, as Jeff steps down to work full time with the County. We had approximately 100 visitors at our table at the Saratoga Blossom Festival – thanks to Jessica and Michael for organizing and supplying it — and thanks to our CERT volunteers who turned out to staff it: Jessica, Lori, Larry, Peter, and Brent. Volunteers needed for the Classic Car Show on July 22. Please contact Jessica at jfullmer@mo-dv.com if you can help. It’s been agreed that in lieu of a city-wide CERT meeting in July that we should have division meetings. There will be a county-wide emergency drill (code name Yellow Command) to take place on Sept 6—which is a Thursday—you can expect to receive a text/phone message, to which you should respond with your status. At this point there is no plans to actually call out CERTs, because it is a weekday. Our next CERT membership meeting will be August 23rd.